Lives and works in Chengdu. Wei Liu received his Master degree from the department of oil painting at the Sichuan Academy of Art in 2010. 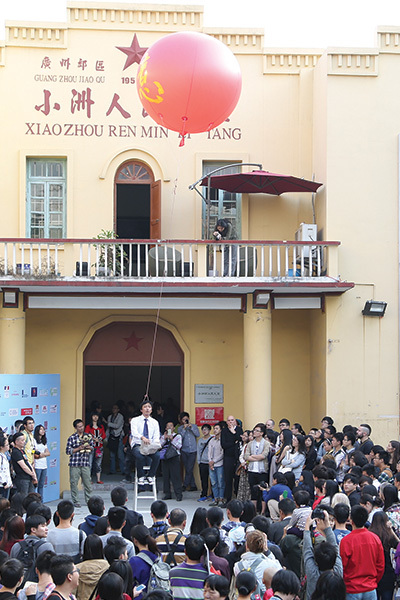 He is today one of the most prominent representatives of a new wave in performance art in China. Wei Liu’s work is all through formally innovative and socially critical. As most of Chinese artists he rarely repeats his performance work. Wei Liu has presented his work at several festivals and exhibitions in China since he graduated (Chengdu, Changsha, Chongqing, Wuzhen), Macau (MIPAF, 2011), Myanmar (MIMAF, 2012) and Thailand (Asiatopia, 2013). In 2011 as well as in 2013 he participated in Guangzhou Live, Live Action’s chinese partner festival. This is the first tiime that his work is presented in Sweden, or for that matter in a Western country. Wei Liu. Agree. Guangzhou Live 4. © Ou Zhihang & Guangzhou Live.